In the last post, Classical Technical Patterns, I discussed the algorithm and pattern definitions presented in the Foundations of Technical Analysis by A. Lo, H. Mamaysky, J. Wang (2000) paper. 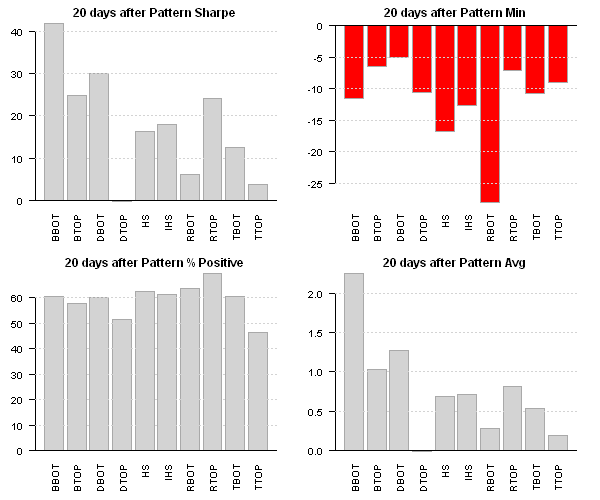 Today, I want to check how different patterns performed historically using SPY. I will follow the rolling window procedure discussed on pages 14-15 of the paper. Let’s begin by loading the historical data for the SPY and running a rolling window pattern search algorithm. There are many patterns that are found multiple times. Let’s remove the entries that refer to the same pattern and keep only the first occurrence. Now we can visualize the performance of each pattern using the charts from my presentation about Seasonality Analysis and Pattern Matching at the R/Finance conference. 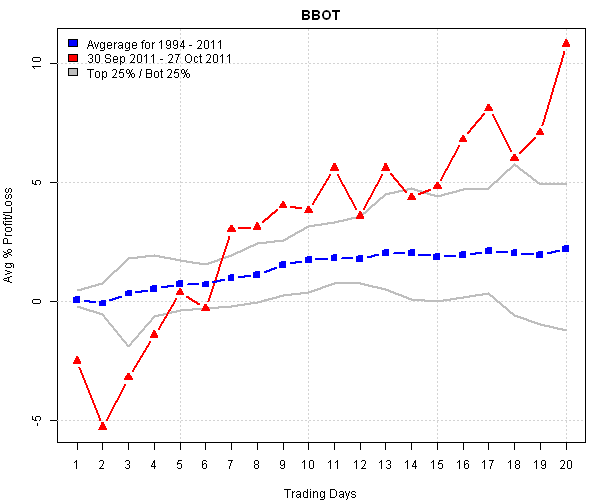 The Broadening bottoms (BBOT) and Rectangle tops (RTOP) worked historically well for SPY. To view the complete source code for this example, please have a look at the bt.patterns.test() function in rfinance2012.r at github. Month of the Year Seasonality – I introduced the Seasonality charts in the Historical Seasonality Analysis: What company in DOW 30 is likely to do well in January? post. 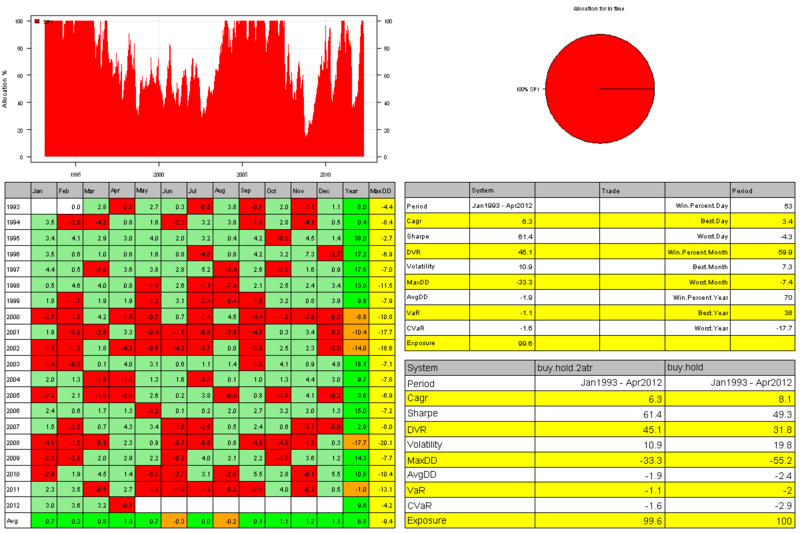 I also developed the Seasonality Tool a free, user-friendly, point and click, application to create Seasonality charts, statistics, and reports. The Seasonality Tool can be downloaded here. What seasonally happens in the first 20 days in May – I introduced intra-month Seasonality charts in the Happy Holidays and Best Wishes for 2012. The intra-month Seasonality charts are also available in the Seasonality Tool, and you can also see the current month intra-month Seasonality chart for SPY at the top right corner of this blog. The only subject in my presentation that I have not discussed previously was about Classical Technical Patterns. For example, the Head and Shoulders pattern, most often seen in up-trends and generally regarded as a reversal pattern. 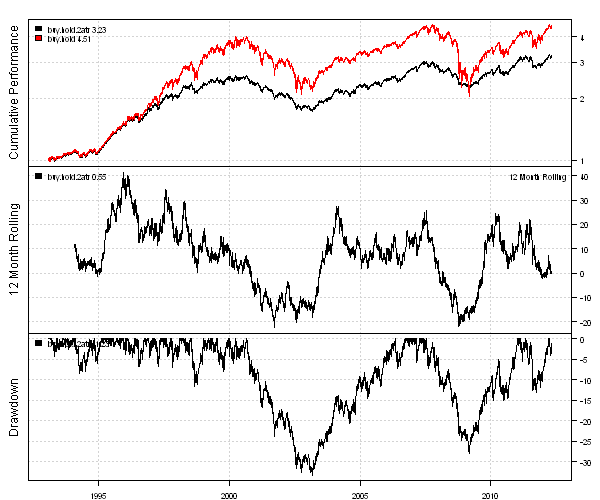 Below I implemented the algorithm and pattern definitions presented in the Foundations of Technical Analysis by A. Lo, H. Mamaysky, J. Wang (2000) paper. First, fit a smoothing estimator, a kernel regression estimator, to approximate time series. Next, determine local extrema, tops and bottoms, using fist derivative of the kernel regression estimator. Define classical technical patterns in terms of tops and bottoms. 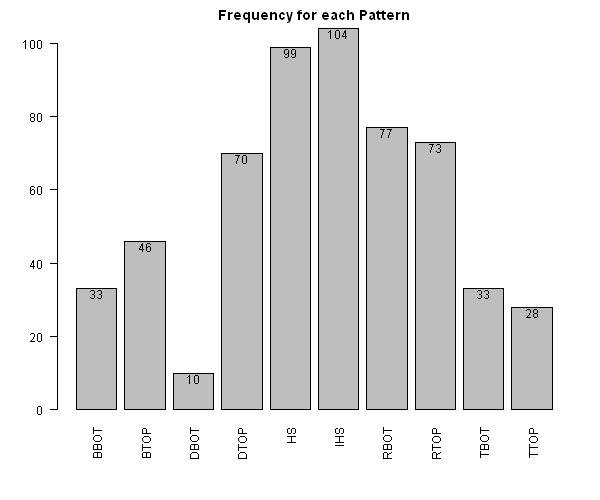 Search for classical technical patterns throughout the tops and bottoms of the kernel regression estimator. I put the logic for the first and second step into the find.extrema() function. The last step is a function that searches for all defined patterns in the kernel regression representation of original time series. It is very easy to define you own custom patterns and I encourage everyone to give it a try. To view the complete source code for this example, please have a look at the pattern.test() function in rfinance2012.r at github. I have attended for the first time the R/Finance conference this year. I must say that I’m impressed with the effort that organizers put into the conference and the breadth and the depth of the material / ideas presented. I just want to share slides and examples that I used in my presentation about Seasonality Analysis and Pattern Matching. In the next post, I plan to discuss in more detail the algorithm and the price pattern definitions I used to find classical technical patterns. Diversification is hard to find nowadays because financial markets are becoming increasingly correlated. I found a good visually presentation of Cross Sectional Correlation of stocks in the S&P 500 index in the Trading correlation by D. Varadi and C. Rittenhouse article. 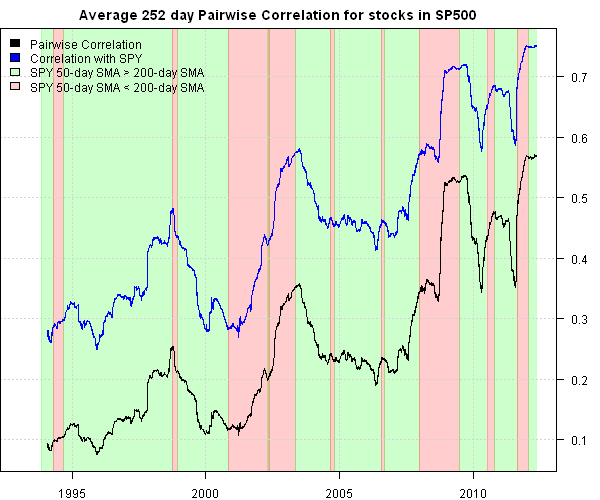 The overall trend for correlations is up. 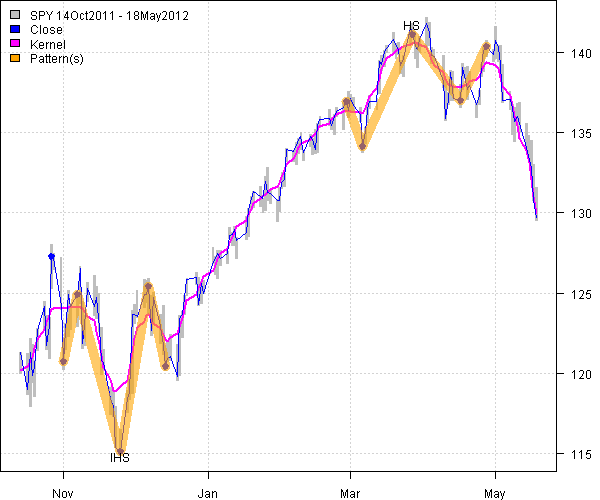 Moreover, correlations are usually rising in the bear markets, when SPY 50-day SMA < 200-day SMA. To view the complete source code for this example, please have a look at the bt.rolling.cor.test() function in bt.test.r at github. Next, let’s modify Buy & Hold strategy to vary it’s allocation according to the Average True Range (ATR). The Sharpe and DVR are both higher for new strategy and draw-downs are lower. To view the complete source code for this example, please have a look at the bt.position.sizing.test() function in bt.test.r at github.